Each year The Toronto Camera Club exhibits a Public Presentation, a fundraiser where we open the doors of our club to the public. It allows non-members to see our facilities, enjoy a two hour presentation of audio-visual shows by TCC photographers, and visit a print show in our gallery . We have been very fortunate this year in that we have sold out the originally planned evenings of Thursday April 25th and Friday April 26th. Due to the demand for tickets, we have added two extra shows on Saturday April 27th – a matinee show at 2:00 pm and an evening presentation at 8:00 pm. Attached is a poster for the audio-visual presentation. “A Photo Journey” will be showcasing Namibia , Iceland, China, Holland, Jordan, Cuba, and the American South West. 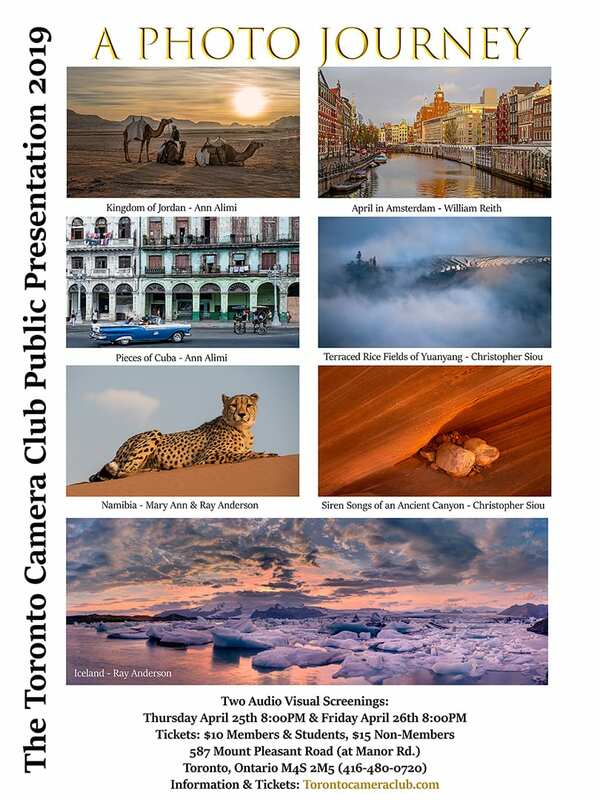 The photographers presenting at this show are award winning photographers from the Toronto Camera Club, including Christopher Siou, the TCC’s most award-winning nature photographer, and Ann Alimi, the OCCC Top Photographer of 2018 in the Greater Toronto Area. We welcome your members to bring friends and family to this event. Please forward this information to your club members and please feel free to share our poster and trailers in your club’s newsletter and on your club’s Facebook page. Thank you for your support of this Toronto Camera Club fundraiser.